Reality Check: Do we use 8.5 billion straws a year in the UK? The claim: We use 8.5 billion plastic straws a year in the UK. Reality Check verdict: Nobody knows exactly how many straws are used each year. While Defra described it as a figure for the number of straws used in the UK, 8.5bn is actually only an estimate of straws used in the fast food industry. McDonald's says the figure it is based on is double the actual figure, which suggests that 8.5 billion is an overestimate for the fast food industry. But straws used for other purposes also need to be taken into account. There was an eye-catching figure in the announcement that the government plans to ban single-use plastic straws. The press release quoted: "a recent study showing 8.5 billion plastic straws are thrown away each year in the UK". 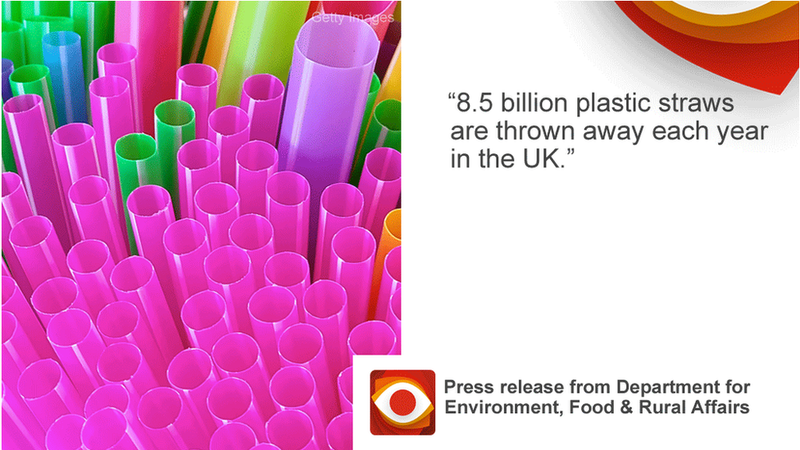 That is a lot of straws - it's about 130 for everybody in the UK every year. It was a report last October into single-use plastics from an organisation called Eunomia. It took an estimate from the campaign group Straw Wars for the number of straws used each day in the UK by the fast food chain McDonalds of 3.5 million (that's about 1.3 billion per year). It then took Euromonitor figures for the proportion of the UK fast food industry held by McDonald's and multiplied up to get to the 8.5 billion figure for the whole of the UK. Clearly this only captures straws used in fast food outlets and not, for example, those used in pubs, restaurants or children's parties. But even using this methodology, McDonald's told Reality Check that the company actually uses 1.8 million straws a day. If you take that through the same calculation it almost halves the numbers, meaning that about 4.4 billion straws are used in fast food outlets each year in the UK - about 67 per person. The researchers at Eunomia told BBC News that their 8.5 billion number was intended as a "tentative, indicative estimate" and stressed that "where the number is reported it should be adequately caveated - as with all statistics". A spokesperson for the Department for Environment, Food and Rural Affairs (Defra) was asked about the reliability of the figure and said: "The 8.5 billion figure is a widely-quoted figure based on research by independent group Eunomia." The same researchers have done further research for the World Wildlife Fund, which estimated that 42 billion straws a year were being used a year in the UK - that's 640 per person. That figure was based on an estimate for total use (not just fast food outlets) from a market research company that said 82 thousand tonnes of plastic straws were used in the 28 countries of the EU. Eunomia then divided based on the sizes of the economies of each country (measured by GDP) to get to 15,700 tonnes for the UK and work that out at 0.4 grams per straw.